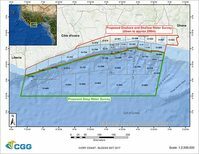 CGG has been awarded a contract by Côte d’Ivoire’s Direction Générale des Hydrocarbures (DGH) and PETROCI, the national oil company, to acquire with its local partner, Harvex Geosolutions, a multi-client program of gravity, gravity gradiometry and magnetic data over the Republic’s onshore and shallow offshore basins. The scheduled 5-month program will deploy CGG’s new Falcon® Full Spectrum gravity solution, the industry’s most sensitive airborne gravity platform, to acquire approximately 28,000 line km of data over onshore and shallow offshore licenses, subject to industry pre-funding commitments. The contract includes an option to acquire a further 26,000 line km over the deepwater offshore licenses. The Falcon Full Spectrum data will be interpreted with existing exploration data to provide details about the basin structure, the sediment thickness and the basement nature in order to help identify areas of mature source rock, reservoir deposition and prospective structures. With some acreage already licenced, this will allow current and future licence holders to better assess their blocks and de-risk future exploration expenditure. The Falcon Full Spectrum solution from CGG Multi-Physics deploys its exclusive Falcon gravity gradiometer with its newly released sGrav gravity system to obtain a high-accuracy gravity signal over a broad bandwidth, significantly improving imaging at depth and increasing spatial resolution for near-surface geology. The system also concurrently collects magnetic data for identifying any igneous intrusions into the sedimentary section and providing further basement imaging.